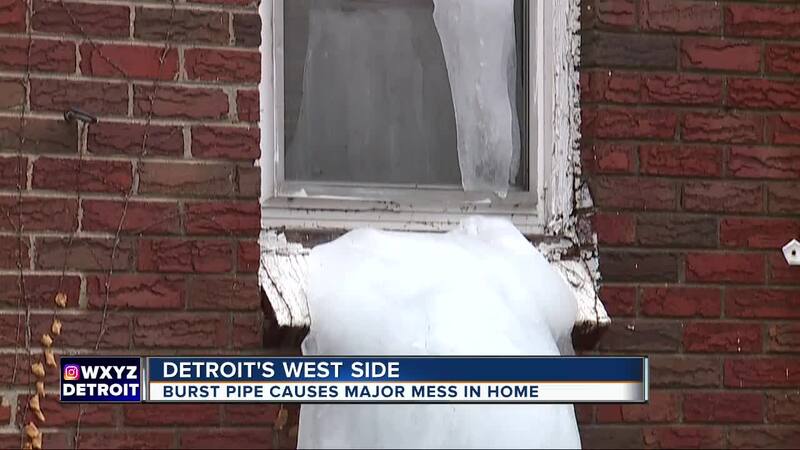 A broken pipe has caused a major problem with ice in a Detroit home. DETROIT (WXYZ) — "I've never seen water pour out of a house like that before," said Sheryl Hardman who lives a couple doors down from a duplex where a busted pipe on the second floor has resulted in what looks like a small iceberg coming out of a first floor window. The duplex is empty, but Delilah Jenkins lives in the adjoining unit. "Oh my God," said Jenkins as she walked into the backyard to see the massive chunk of ice. "The ice ice coming out of the window here. This is ridiculous." Jenkins lives next door and said the property owner has been working to rent the empty unit out. Over the summer they installed a new furnace and hot water tank. They even hired painters, but, unfortunately, neighbors say it appears they left the upstairs windows open and never returned to close them. And one peek inside a first floor window and it's clear that no one will be living inside the unit for some time as the ceiling has caved in, leaving soaked debris all over the kitchen area. A 7 Action News could still hear the water running and contacted the property manager. We were told they would send someone out. Jenkins didn't think her unit was affected. "My house is perfect," Jenkins said just minutes before going into her basement in hopes of reassuring herself. Unfortunately, Jenkins was wrong. She walked into her basement to find about two inches of standing water. "I had no idea until you guys came over and I came down here to look," said Jenkins. "This is disgusting." Jenkins contacted the same property manager who did send someone out to turn off the water. She's now waiting on a plumber.